Fill out one application and apply to any job. Get started by creating a ZippyApp profile which includes a standard employment application and an optional resume and cover letter. 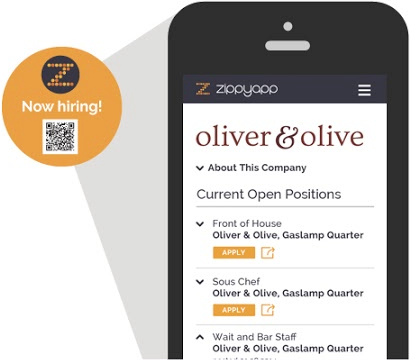 Now you're ready to apply for any job on the ZippyApp website or at participating businesses - just look for the ZippyApp logo, scan the QR code, and apply with just a few clicks. It's that simple! Apply for jobs on any device, anywhere, anytime! Sign up for a free account to start your application! ZippyApp © 2019 by Talentral Corp.